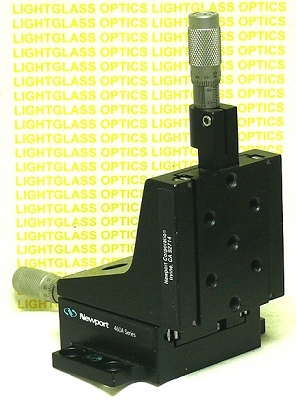 The Newport 460A-XZ High-Performance Integrated Ball Bearing Linear Stage consists of a Newport 460A-X integrated stage with a 460A-Z stage mounted to it. The Newport SM-13 Micrometer Actuators shown are included. This stage utilizes ball bearings running on precision-ground stainless steel rods for smooth and accurate travel. Total travel in each axis is 13mm / 0.5 inches. This stage will accept any of Newports standard actuators. Please email us if you wish to upgrade the actuators to any others we have in stock. Vertical Load capacity is 5 pounds.